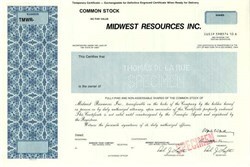 Beautifully engraved SPECIMEN certificate from Midwest Resources Inc. This historic document was printed by Thomas de la Rue and has a block border. This item has the printed signatures of the Company's Officers.